Occasionally, differences in ELISA/EIA results are observed from what is expected. In most cases, these differences relate to one or more factors: kit storage conditions, faulty laboratory equipment, technician error, or other factors that are likely to be causing the poor performance. Check: The plate washer may be out of calibration and delivering low wash volumes or unequal dispenses. We would recommend performing a volume verification test, as recommended by the plate washer manufacturer. Check: If only a partial run of the plate was performed, there may have been technician error in preparing the dilution of the conjugate by not scaling down the amounts of conjugate concentrate and assay diluent properly. Check: The wash buffer may have been over diluted. Some labs try to conserve on reagents by diluting the wash buffer concentrate beyond the recommended 10X or by decreasing the number of wash steps. Either of these changes would result in poor washing because the detergent action would be lowered. In this condition, it is likely that the unbound HRP-analyte conjugate would not be completely washed away, resulting in excess conversion of the TMB substrate to colored product and higher OD readings. Check: The plate must be read at the wavelength specified in the kit insert, which is 450 nm for Salimetrics EIA kits. Substituting other wavelength filters for the primary reading will seriously affect the OD readings. If using a plate reader with dual wavelength analysis, customers should understand that using a correction at a secondary wavelength other than the one used in the Salimetrics Laboratory will also affect the OD readings slightly. 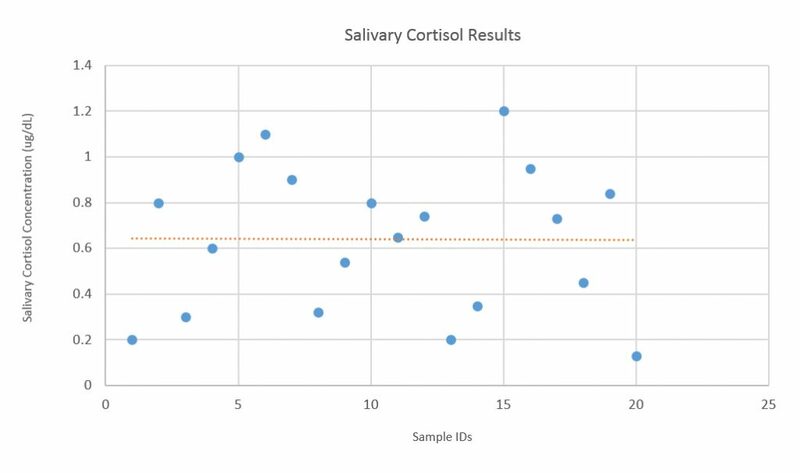 For example, we use a correction at 492 nm with the cortisol kit, but the protocol specifies a range of 490-630 nm as acceptable. Customers may use a different wavelength within this range if they prefer, but they should then expect the OD readings to be slightly different from the examples given in the protocol.